Well I started this post mid August, but gathering all the images has taken me some time…so here we are mid / approaching the end of September! The tansy is browning out and the blackberries are coming in by handfuls, the days are cooling and the swimming is reserved for a special warm mid day treat, the leaves are starting to turn and we have begun the annual hickory nut harvest, the early autumnal signs are here and there. This growing season has been a leap year. Ever since reading Paradise Lot, by Eric Toensmeier (go read it right now, it is wonderful!) I have fully ascribed to his observation of creep, creep and leap. That plants take time to really root and establish. From what we see above ground, they creep for a few years, and then something happens around year 3 (sometimes 2 or 4), they leap. And while that isn't always the case, we have seen that play out fairly wide spread across our property. When we moved in three year ago (really, it feels like we have always been here and I can't believe it has only been just over three years!) this house hadn't been lived in for awhile (something like 5 years, I honestly can't remember what the realtor had told us), it had previously been maintained, but was currently in rough shape. We have done so much, having all the active knob and tube wiring removed and it safely wired, ripped out tons of carpet and laid wood floors, taken down the wall paper that was in every room, repairing lots of dry wall, replacing al lot of rotten trim boards, repainting all the trim, replacing the water main, completely gutting and redoing the bathroom, the list goes on and on for the house, and that is just the house, we have invested even more time and energy into the land. Sometimes we feel like all we do is work, which of course then, sometimes it feels like we miss other things we love. But then we go out in the evening sun and harvest our dinner and handfuls of berries for desert, we collect the eggs and chat with the geese, we watch the horse run in the fields and we realize these seasons of work, of establishment, things missed, little sleep and tired bodies, it is all so beautiful and totally worth it and we love the work. For those who maybe don't know, our little brown house (or as Anna calls it "our big brown house" haha!) which is possibly 1000 sqft, maybe less... is nestled into a very steep northeast slope. The house is at the bottom edge of our property, but is a little below mid slope in terms of the overall slope of the land around is. We have an acre, a lot of clay at the bottom and a lot of ledge as you go up. When we moved in the steep northeast slope was lacking any sort of flat / usable space (hard to imagine for an acre, we know). It was completely dominated by over story trees (Spruces, oaks, maples, choke cherries, pine, cedar and a few walnuts) and a dense scrubby, brambly understory of shrubs and vines. There was very little sun that made its way through the canopy. There was no flat ground, (other than the drive way that used to come right up to the front door), and one needed boots, pants and long sleeves to safely venture up slope. We worked, what seemed like endlessly, to transform the landscape, reshaping the property and creating usable spaces and flow. Doing major earthworks by renting machines, building many stone walls and putting in swales / terraces to change the hillside and create flat growing spaces. We very selectively removed a lot of trees and undergrowth, to keep a few mature trees but to allow us to get sun. And I tell you, after the first few big cuts and when all the new plants were nothing but twigs sticking out of mud, it was quite a barren scene here, I felt a little like the orcs at isengard :( and I was sure that our neighbors must think we hated nature, haha! I couldn't wait for the plants to come back, the trees to look like trees and the shrubs to look like shrubs, I couldn't wait for things to look alive and full. We planted more plants that could ever be kept track of, trees and shrubs, vines, herbaceous perennials and ground covers, hundreds of tiny trees and shrubs and hundreds and hundreds of perennials that were mostly started by seed. And our property has by no means "arrived", there is more work to be done that was has already been done (and quite honestly there will always be more work, which we do love), but like I said, this year it has leaped! Our back gardens have finally become the cute (still growing in) garden of our dreams—little family gardens, perennials, annuals, cutting flowers, the orchards and play spaces, the shady hammock! 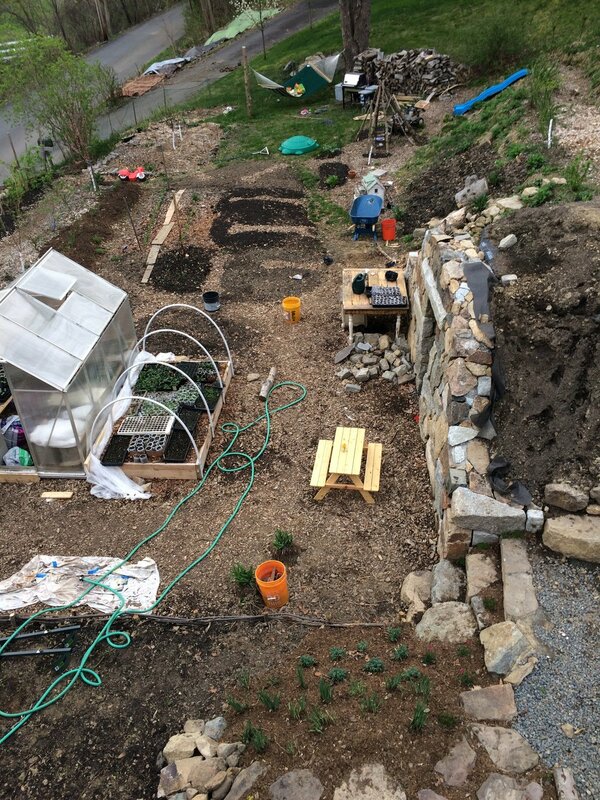 With the root cellar nearly done, all the the major construction there has cease. The gardens are maturing the hazelnuts, blackberries, raspeberries, seaberries, goumis, ribes, grapes, etc. are all large and beautiful. The peaches are huge, the cherries are coming along, as with the persimmon, pears and apples. The species diversity has skyrocketed, never have I seen so many different types of creatures here (birds, mammals, insects), specifically bugs. So many different types of bugs, I am constantly trying to identify them. More different species of bees than I have seen before (along with our own honey bees), an impressive amount of monarch butteries and a frequent showing of hummingbirds and humming bird moths! Things always blooming from early spring until late fall. Our birds, our cats, our girls playing out in the garden, the vibrancy of life all around. 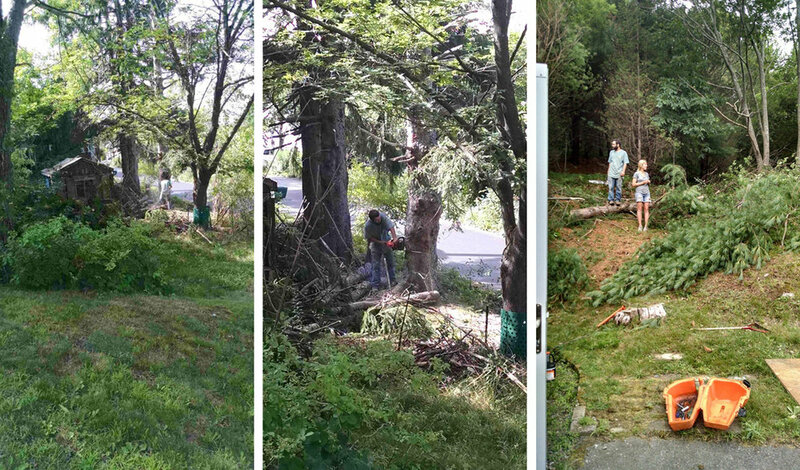 Already starting clearing the land, but realized one night just before dark that we need some before pictures, so my mom took these three really quick for us. Cutting down the spruces (image 1 and 2) me and johnny surveying part of the front slope as we start clearing. Johnny rebuilding the wall along the road, instead of a very low 1 ft wall, this will be a five foot wall, along the back to be flat, instead of sloping down to the road. Huge spruces are down, but stumps are still sticking up, later they will be cut down to below grade and are where the second hugelkultur bed now is. Giant wood chip pile that we will use everywhere. Log and brush piles everywhere. Separating out wood to split for indoor firewood and outdoor firewood. Rotting shed full of old trash and rodent awaiting to be removed. And lastly we borrowed a kid “play pin” from a friend as an attempt to keep Anna (who was just over 1) contained and safe from the hazards of our projects…turns out she didn’t like being put in a cage…go figure. Slopes not terraced, some trees have been cleared, others still need to be. Rotting shed still there. Finished clearing the area, pilling brush to burn, cutting up logs. beginnings of the root cellar (later we will determine in needs to get further dug out and Johnny and I will d that over the course of a weekend in November by hand.) Slope have been freshly terraced. Next few images from same work day. There was a lot of time spend splitting wood, mostly by hand, but one day our neighbor lent us his splitter and boy, did that speed things up. Johnny’s finished wall cover in snow as we gear up for the brush fire. The last of the brush fires in this area. 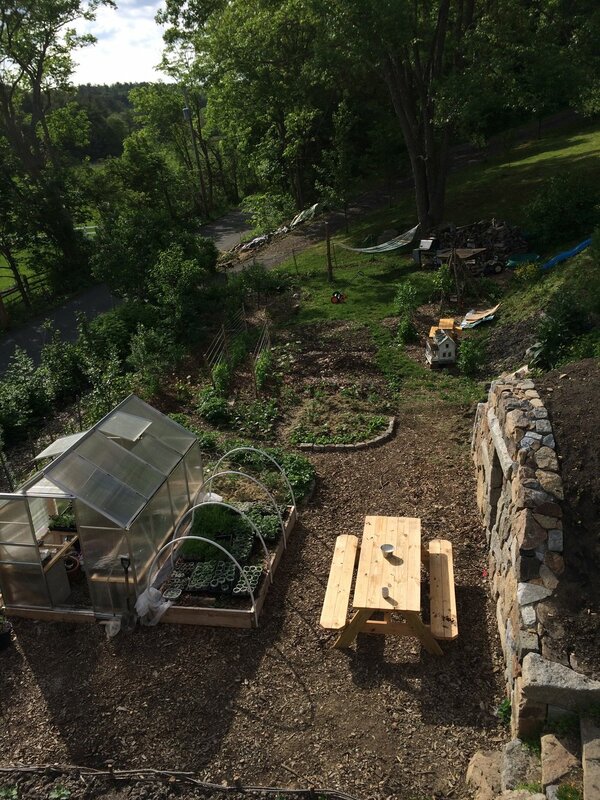 Bench seat set, bare land from all the construction and shaping of the hillside. Putting in the hugelkutlur beds on bottom 2 of 4 levels of terraces and along stone wall. Mud season huglekutur, which means boards were needed to move material around. Same view, things are just starting to grow again. 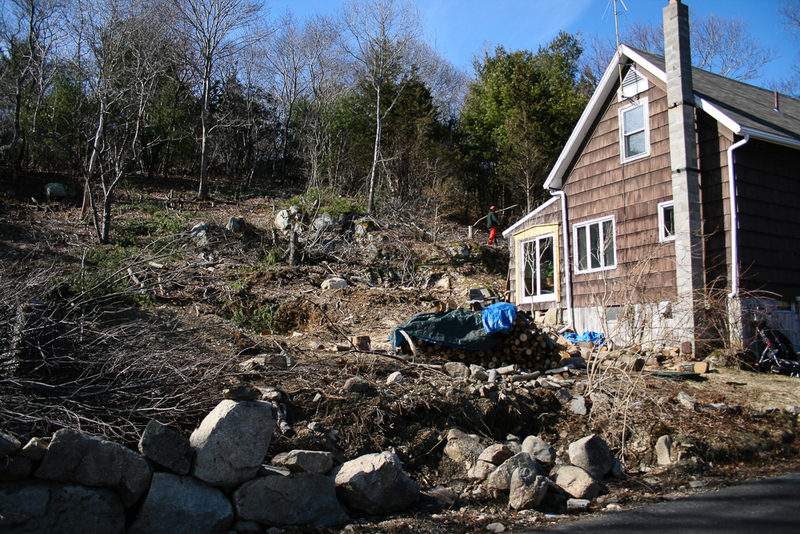 Slopes have already been terraced, most of this space is a construction zone for the root cellar. You can see the two huglekultur rows by the wall near the road are newly planted (the snap peas that are vining on the ground in front of them are more substantial than the tiny trees and shrubs. Little twig trees and shrubs getting lost in the Annuals and herbaceous perennials. Temporary put in during a huge heat wave, it was nice to have a place for gathering / construction, however we knew it wasn’t the long term plan and we have since decided that give the flow of our space and where we get full sun, a patio was not the right use for the sunniest spot of the back, so now that is where the green house and raised bed is. The patio, hugelkutlur ged, the grassy area and the construction zone. Root cellar dug out and foundation of crushed stone put in with drainage pipes. Patio / construction staging area. The finish Greenhouse in its temporary location. Back Hugelkultur beds, the little twigs are growing, on the left you have Hazelnuts, followed by raspberries at the far end. On the right we have a mix of peaches, dwarf sour cherry, seaberry and guomi. Annuals and perennials still more impressive than the shrubs and trees. Our green house in its old location, put there while the construction of the root cellar was still happening. View from up slope, down at the property and at the farm across the road. The hugelkultur beds by the road. 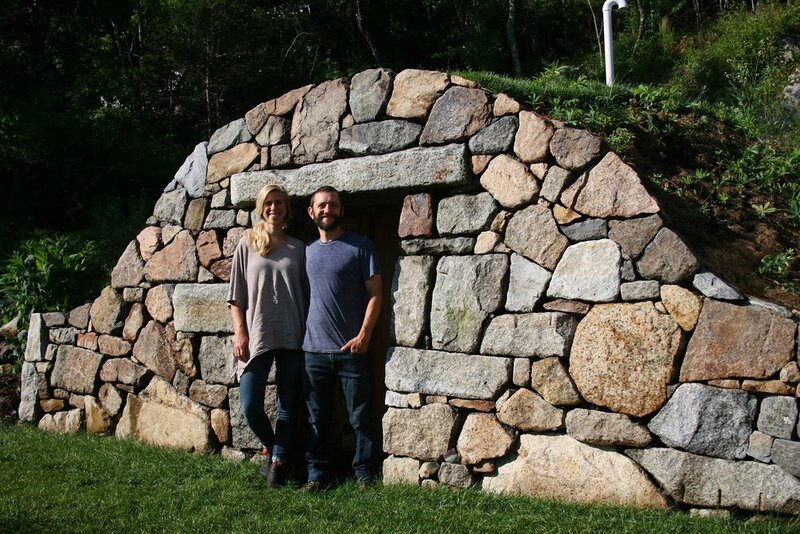 A man building his root cellar dreams…always experimenting on our property. 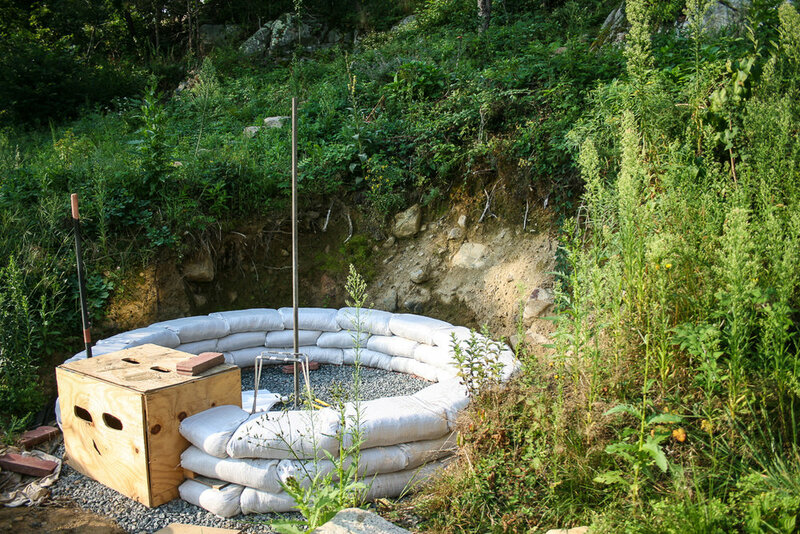 The huglekultur beds explosion. We have hazelnuts, blackberries and raspberries on right. But give the massive growth of the blackberries, we are moving them this fall, we are adding mid slop terraces to our existing terraces and these will go with two other that are on the slope behind the root cellar. Under the fruit trees and shrubs on the left, we have a few annuals that are now crowded out. There is a mix of herbaceous perennials (echinacea, comfrey, lavender, yarrow, walking onions, etc.) and a ground cover of both woodland strawberries and some ever bearing strawberries. Amidst all the struggles, the stresses, the ups and down of life–finances, work, faith, relationships, parenting, ect. Johnny and I still can't believe that this is our home. That this is quite literally the "fruit of our labor", the tight budgets to pay off student loans and save for a down payment, the tight budgets to work on the property, the countless hours invested...we have poured ourselves into this place. And while there are things about our property that are HUGE challenges (the slope, always the slope and as a result, sun is a challenge, we have full sun in places, but a lot of part sun, and even our full sun isn't idea for veggie production, because they are greedy and want more than 8 hours of sun, haha) we love this land. We are so blessed that we found this patch of earth to make and call home. And who know where life will take us, but we plan on walking up and down these hill until our bodies fail us. Welcome to Orchard Slope! I like to share stories of our travels, our homestead and our lives, thanks for stopping by!